To understand this technique you can think of a Chiropractor, who has to adjust and bring back a vertebrae which is out of place. Chiropractors use spinal assessment and adjustment to reduce the subluxation, and thus alleviate irritation of the nerves. Visceral manipulation and abdominal organs mobilization has the same concept. 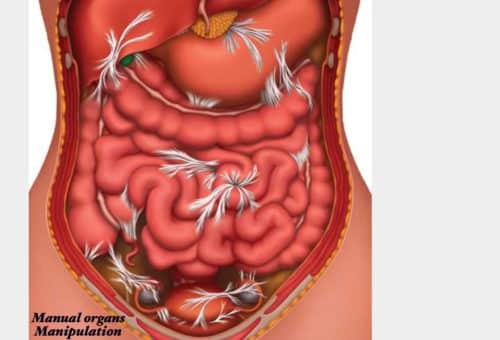 Very complex structures of nerves, arteries, veins, lymphatic nods and vessels are housed in the abdomen. When practitioners manually adjust abdominal organs, they remove tension, spasms and drooping organs; allowing them to be restored to their proper place. This procedure is incredibly relaxing because all three nervous systems are influenced. The goal is balance and normalcy though enhanced circulation, elimination and digestion. Normalization of compromised structure always improve function. 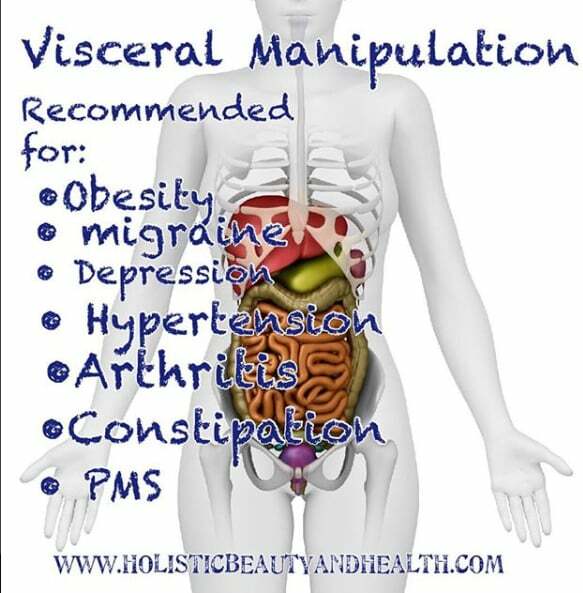 Visceral manipulation is a form of treatment based on the concept that the abdominal organs hold keys to the physical and psychological well being of the organism. • Use of drugs (Prescription or over the counter). Especially antibiotics. All of the above mentioned triggers are conducive to connective tissues stiffening and restricting, when organs are no longer freely mobile in their cavities, but fixed to other structures or each other. Unfortunately, normal adaptation and compensatory reactions of the body, when traumatic stimulus are chronic or repetitive, may lead to functional and or structural damage. Sadly, in our society the emphasis is on nutrition, even though since the dawn of time many great visionaries and scientists have recognized and acknowledged the fact that good elimination is the main, if not the only, contributor to robust mental and physical health as well as longevity. A combination of manual treatments such as: Visceral Manipulation and Lymphatic Decongestion therapy triggers healing responses of the body with the first touch of the practitioner. At the end of the treatment all of the body’s healing processes have been accelerated to the degree that all patients have reported exceptionally profound positive shifts and heightened feelings of well being on both mental and physical levels. Before and during the treatments, we educate patients on healthy lifestyles with special emphasis on the importance of thorough understanding of physiological, biochemical and mental processes. We also examine their impact on the psychological and physical health of the individual patient. This professional knowledge will help you throughout your life to make choices which are beneficial for your health. You would not be easily manipulated by advertising, special interest groups or well-meaning amateurs. • 95% of serotonin, the feel good hormone, is produced by the small intestines. • The gut has its own nervous system, called the Enteric Nervous System. It is able to support its own function without directions and guidance of Central Nervous System. We can safely assume that the human gut is intelligent and has an enormous effect on not only health and well being but also mood. • The gastrointestinal tract is the home of more than 1,000 different strains of bacteria. Having a balanced variety of bacteria strains with the right amounts plays one of the key roles in the maintenance of good health. • Bacteria digests our food for us. They synthesize enzymes, vitamins, minerals, and amino acids. Essentially; they are decomposing our accumulated, uneliminated toxic waste. In short they are indispensable. They are literally the building blocks of life. These invisible bacterial creatures are so super important that life will seize to exist without them. Life on this planet; as we know it; starts, continues and ends due to the hard work of Bacteria, Fungi, Yeast and Viruses. There is a huge amount of irrefutable proof and information supporting the fact that mental and physiological well being of live organisms to a large degree depends upon smooth functioning of the gut and other organs. Scientists from the Francombe Family Digestive Health Research Institute at McMaster University have discovered that visceral manipulation plays an important role in inducing anxiety and depression. • And many other forms of human suffering which easily, with minimal proper knowledge, can be avoided.